Berlin: Whose City is it Anyway? Ich bin ein Deutschen volke. Berlin: Whose City is it Anyway?My hotel in Berlin had a confused personality. The chain was Russian, one I’d stayed with before in Vladivostok, but the core of the hotel lay in an old West Berlin building, just around the corner from the bombed-out Kaiser Wilhelm cathedral. The rest of the hotel was jammed into two more recently converted buildings, resulting in a predictable mess – floors that didn’t connect with each other, corridors that zigzagged back and forth, and terrible wifi reception. It wasn’t a bad hotel though, not least because of its central location near the Berlin Zoo, and in its confusion it proved a fitting introduction to Berlin itself. That Berlin lacks a unifying identity shouldn’t be that surprising. It was only twenty five years ago that the Berlin Wall, which split the city into two, was taken down. Further back, the city was divided into four, with zones of West Berlin administrated by the French, British and Americans. The period in which Berlin was the capital of a unified German nation/empire was a short one by European standards: prior to that, it was the capital of Prussia, which was as concerned with Russia, Sweden, Poland and Lithuania as it was with the rest of what would one day become Germany. So while the Berlin of today is German, it’s very cosmopolitan in terms of what being German means, something that its recent history has only added to. This is a city that has a monument to the Soviet soldiers who died in the Battle of Berlin at the end of WWII. I’ve been trying to think of another city that commemorates its conquerors and occupiers and haven’t come up with one. The two locals who helped me find my way around the city were both originally from elsewhere – a Bulgarian and a Swede. They’re now part of a Berlin melting pot that fits well with a city standing on the border between East and West. Though plenty of traces of recent divisions remain, that border is becoming blurred as building works continue and people move back and forth. Were it not for preserved monuments and a modest line of bricks running through pavements across the city, it would be hard to guess just where the Berlin Wall once stood. As for a German Berlin, it’s there if you look for it. The Victory Column in Tiergarten is adorned with mosaics reflecting the history and coming together of the German people. (The column itself has been moved three times though.) The museums on Museum Island contain both relics from German history and relics that Germany collected during its brief imperial phase. (And the curators can’t quite resist leaving grumpy signs complaining that the Soviets took all of the best and most portable stuff in 1945 and refuse to give it back.) 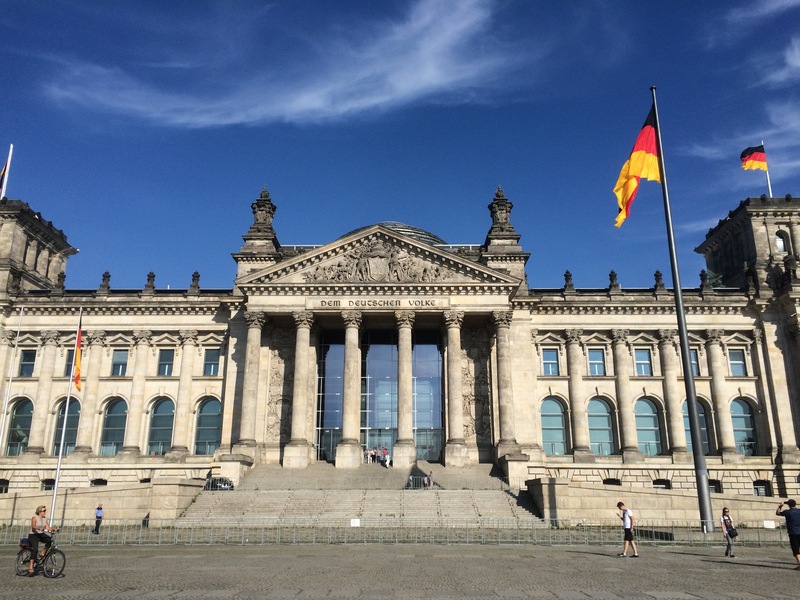 And the Reichstag still has the words “Dem Deutschen Volke” engraved on its facade. Though given Germany’s role in Europe and the willingness of people from everywhere to come and participate, the definition of “Deutschen Volke” is now likely more universal than the original engravers intended. Whenever I mentioned travelling in Europe in the past, or when I mentioned not having been to Berlin, the response was always the same: “You have to go.” Well, now I’ve been, and while the hype may have been excessive, the experience was worthwhile. Three days was nowhere near enough time to experience this sprawling, multifaceted, scarred and vibrant city. I already have a list of things to do for the next time I come back (probably not until after 2019, when the Pergamon Museum finally finishes its renovation). In the meantime, I’ve got the memories and the new experiences as the train heads south through sun-kissed forests and fields of grain, through Dresden and Bad Schandau, into the Elbe valley of forested limestone cliffs, heading for Prague.